Autumn rains are falling in Montana, and our southern coastal states are drying out. It’s finally time to have a serious conversation about climate change. 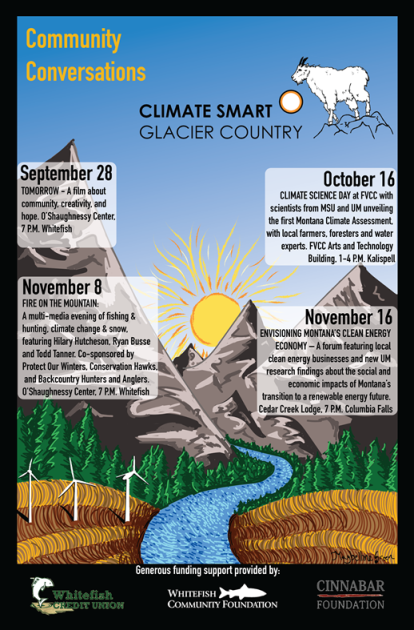 Climate Smart Glacier Country invites you to join us at four community forums this fall focused on emerging climate challenges and local solutions. Our recently formed public-private partnership is focused on pragmatic ways to develop a clean energy economy and prepare our Flathead communities for a new climatic normal. We want to set the table for constructive conversations about what’s at stake and what we can do about it. This month has been a personal trial for me as it may have been for you. The choking smoke was oppressive at the end of a fiery summer that was 4 °F hotter than the average Montana summer. Meanwhile, my cousin in Houston struggles to salvage his flooded home and my niece in southern Florida spent 16 frightening hours on a congested highway fleeing Hurricane Irma. As most climate scientists are quick to point out, you can’t say that any of this weird weather is directly caused by anthropogenic climate change. But we can say that 2017 is on track to join the past three years as the hottest four years in global records. Warmer-than-usual oceans and increased evaporation supercharged the hurricanes. We can say that another hot, dry summer in Montana, long predicted by climate models, created the conditions to torch rangeland, 20-year-old clearcuts, mature forests, and homes in the wildland-urban interface. Perhaps it’s simply random that the Earth has experienced four record-breaking years of heat in a row. But let’s be honest with ourselves – it’s probably not coincidence. While annual global temperatures fluctuate year to year, the trend is clear. Average annual temperatures in Glacier National Park increased 2.4 °F over the past 100 years. Fire seasons are almost a month longer. And unless humankind rapidly reduces our emission of carbon pollution, western Montana will see another 7 °F increase this century. That’s downright scary, but it’s a choice that’s still ours to make. Too many Americans have the mistaken impression that physics is political, even though the basic science of the climatic “greenhouse effect” due to carbon dioxide emissions has been understood for more than 150 years. This false sense that science is an ideology contributes to a spiral of silence in which most Americans are concerned about climate change but few dare discuss it with friends and family. But like any serious problem, we need to be able to discuss it openly if we have any hope of solving it. The premise of Climate Smart Glacier Country is that many Flathead County residents are ready to have mature, adult conversations about this threat to our way of life. We believe the best way to do this is by focusing on local solutions. We can conserve energy AND save money. We believe that clear-eyed understanding of climate trends and projections will help us build resilient communities. The Climate Smart Educational Series kicks off on Thursday, September 28 in Whitefish with a free screening of TOMORROW, which documents stories about neighbors creating community solutions all around the world for sustainable food, energy, and transportation systems. It will be followed by an opportunity to discuss local solutions here in the Flathead. Hunting and ski season take the stage on Wednesday, November 8 with a multi-media evening in Whitefish focused on fishing and hunting, climate change and snow. And a November 16 forum in Columbia Falls will envision Montana’s transition to a clean energy economy. Full details of the educational series can be found here. Former climate skeptic Senator Steve Daines recently acknowledged that global warming is happening and human activity is a major contributor. “The question is what then should we do,” he told a radio journalist. I agree. Let’s get on it! Thursday, September 28, 7 p.m. in Whitefish: TOMORROW – A film about community, creativity and. Co-sponsored by AERO, the Alternative Energy Resource Organization, and Farm Hands – Nourish the Flathead. Venue: O’Shaughnessy Cultural Arts Center. Monday, October 16, 1-4 p.m. in Kalispell: MONTANA CLIMATE SCIENCE DAY – A presentation of the first Montana Climate Assessment by a team of scientists at the University of Montana and Montana State University. Co-sponsored by UM, MSU, and Flathead Valley Community College. Venue: FVCC Arts and Technology Building Large Community Room. Wednesday, November 8, 7 p.m. in Whitefish: FIRE ON THE MOUNTAIN: A Multi-Media Evening of Fishing & Hunting, Climate Change & Snow Featuring Hilary Hutcheson, Ryan Busse and Todd Tanner. Co-sponsored by Protect our Winters, Conservation Hawks, and Backcountry Hunters and Anglers. Venue: O’Shaughnessy Cultural Arts Center. Thursday, November 16, 7 p.m. in Columbia Falls: ENVISIONING MONTANA’S CLEAN ENERGY ECONOMY – A forum featuring local clean energy businesses and a new UM research white paper on the social and economic impacts of Montana’s transition to a renewable energy future. Venue: Cedar Creek Lodge. Funding support provided by Whitefish Community Foundation, Cinnabar Foundation and Whitefish Credit Union.